Here are 107 of the best celebrity graduation quotes of all time for commencement speech season. Everyone from Will Ferrell to Bill Cosby to Whoopi Goldberg and everyone in between have given graduation speeches at universities for years. So here are some of the best celebrity graduation quotes that range from the funny to the inspirational to the flat out great advice. "Try putting your iPhones down every once in a while and look at people’s faces." "There’s few things that get you over your own crap more than working hard." "The world doesn’t care how many times you fall down, as long as it’s one fewer than the number of times you get back up." "I have TWO things I hope you remember from all this, other than…the fact that I’ve been known to pee myself…"
"Responsibility to yourself means that you don’t fall for shallow and easy solutions—it means that you refuse to sell your talents and aspirations short." "You have to leave the city of your comfort and go into the wilderness of your intuition." "I’m a bit nervous speaking to you. Or I would be if me wasn’t totally mashed." "Being a musician is not something you chose to be, it is something you are, like tall or short or straight or gay. There is no choice, either you is or you ain’t." "The biggest uncontrolled gusher of pollution, by far, is the global warming pollution we’re putting up at the rate of 90 million tons per day." You're currently reading the greatest graduation quotes. Keep reading for more! "Truth eludes us if we do not concentrate our attention totally on its pursuit." "…our sense of belonging must extend beyond the limits of our immediate self-interests to take in a larger landscape of possibility." "I say that poverty in America is not inevitable, nor necessary. Indeed, just the opposite is true." "I graduated in 1989, and I’d focused almost entirely on the Soviet Union and communism … so when the Berlin wall fell, I was, well, I was screwed." "I too turned to Webster’s Dictionary and it defined Harvard University as a season for gathering crops." "We live by what we believe, not by what we see." "So find your place to stand — your place of wisdom and peace and strength. And from that place, lead the third women’s revolution." "Just remember, you can’t climb the ladder of success with your hands in your pockets." "… I could have said something profound, but you would have forgotten it in 15 minutes – which is the afterlife of a graduation speech." "Democracy in a nation of more than three hundred million people is inherently difficult." "… a relentless focus on the outward markers of success can lead to complacency. It can make you lazy." "When I was here there was still a requirement that students had to swim 50 yards to graduate…because Harry Elkins Widener had drowned with the sinking of the Titanic. And it made me very grateful at the time that he had not gone down in a plane crash." "Nobody likes to fail, but failure is an essential part of life and of learning. If your uniform isn’t dirty, you haven’t been in the game." "So the mission of … every empowered person in the world in this time has to be to build up the positive and reduce those negative forces of our interdependence." "… it’s not for you to stand around and measure yourself according to diplomas and degrees. You are you, and you are not to go beneath … or put yourself beneath anybody." "Pay off your student loan. Even if you don’t have a job…Because when you finally get a job you’re going to be one of us." "Don’t let complexity stop you. Be activists. Take on the big inequities. It will be one of the great experiences of your lives." "So, what’s it like in the real world? Well, the food is better, but beyond that, I don’t recommend it." "The most important words that have helped me in life when things have gone right or when things have gone wrong are ‘accept responsibility.’"
"Opportunity Can Be Manufactured. Yes, you can wait around for the right set of circumstances to fall into place and then leap into action but you can also create those set of circumstances on your own." "Get outside of the box. Make things happen, be your own person." "I don’t believe in luck, I believe in preparation." "I’m a huge fan of America,…you know the [fans] that read the CD notes and follow you into bathrooms and ask you all kinds of annoying questions about why you didn’t live up to that." "That real happiness, real contentment has to be IN you regardless of professional achievement and amount of wealth." "… so while I wish your dreams to come true I also want to tell you that your best life may be in the undreamed. So watch for the undreamed." "I can tell you how bad our boards are… I don’t have to watch Saturday Night Live anymore; I just go to the board meetings." "The Holy Spirit said to me, ‘The only time you lose at something is when you don’t learn from that experience.’"
"Always have a purpose in life that is beyond position and money." "Optimism is a notion that there’s sufficient evidence that would allow us to infer that if we keep doing what we’re doing, things will get better. I don’t believe that. I’m a prisoner of hope." "[You must] swear that you will make conscious choices and infuse your being in those ordinary moments so they might resound with your love." "Despite difficulties, always keep optimism. ‘I can overcome these difficulties.’ That mental attitude itself will bring inner strength and self-confidence." "I’ve observed a few things about the few really great people I’ve had a chance to meet and cover…They need to be around people. You and I require sleep. They require people." "There is a way to have a very, very satisfying, enriching and creative life in the arts, but it depends on what criteria you use." "It is extremely difficult to stay alert and attentive, instead of getting hypnotized by the constant monologue inside your own head (may be happening right now)." "I found that nothing in life is worthwhile unless you take risks." "Now I usually try not to give advice. Information, yes, advice, no. But, what has worked for me may not work for you. Well, take for instance what has worked for me. Wigs. Tight clothes. Push-up bras." "It’s not a matter of if you will face adversity in your life but when. So when adversity knocks on your door, see it as an opportunity." "But to understand why fear is good, one has to stop viewing fear as a feeling, emotion or behavioral command, and start looking at it simply as information." "It was so important for me to lose everything because I found what the most important thing is. The most important thing is to be true to yourself." "Learn to trust yourself. That’s very vital. … Just stand with yourself. Remember, in his lifetime, Van Gogh sold only two paintings. I personally sold even fewer." "In this time of recession, it is the time for invention. Did you know both the telephone and the automobile were invented during recessions? So was 'talking dirty.'" "It is likely that human beings will find fulfillment and will be rewarded for…intelligence, hard work, honesty, a sense of character, loyalty to family and friends, and above all love and faith." "Remember that there’s no one way of doing things. … If you just get a hammer and hit it really hard, whatever it is, I guarantee you it’ll open." "In the perspective of infinity, our differences are infinitesimal." "You cannot authentically live anyone’s life but your own. That is the deal life offers us." "The future success of our nation depends on our ability to understand the difference between right and wrong and to have the strength of character to make the right choices." "Yesterday is gone, tomorrow may never come, but as long as we have today, we can change the world." "I wish that someone had said to me that it’s normal to feel lost for a little while." "It is impossible to live without failing at something, unless you live so cautiously that you might as well not have lived at all—in which case, you fail by default." "When [you’re scared] … go back to the days of your childhood, go in the 100 Acre Wood, take a deep breath and just say, “I’m stronger than I seem, I’m braver than I believe, and I’m smarter than I think.”"
"I’ve learned that I can pretty much do anything I’ve wanted to as long as I was methodical and diligent about it." "“YES AND” is the vital and only rule of improvisation. Never deny your fellow actor." "… one day you will understand that it is harder to be kind than to be clever." "Your diploma does not represent the end of your education, but the beginning of your continuing education." "You may build a building or hit someone over the head. The choice is yours." "For the great enemy of truth is very often not the lie — deliberate, contrived and dishonest — but the myth — persistent, persuasive, and unrealistic." "Where a child is born, what color that child is or how much money that child’s parents make often determines the quality of his or her education." "Our country doesn’t depend on the heroism of every citizen. But all of us should be worthy of the sacrifices made on our behalf." "So how do you know what is the right path to choose to get the result that you desire? And the honest answer is this. You won’t." "Being attentive to the needs of others might not be the point of life, but it is the work of life." "Live all of your life. Understand it, see it, appreciate it. And have fun." "When I made coffee and Xeroxed and distributed newspapers at ABC News, I thought my life was over." "Insist on heroes. And be one." "On behalf of frogs, fish, pigs, bears and all of the other species who are lower than you on the food chain, thank you for dedicating your lives to saving our world and our home." "A woman’s reach should exceed her grasp, or what’s a heaven for?" "Just because you get old, it doesn’t mean you have to let go of your youthful inquisitiveness." "You can’t pursue something and be committed to it if you’re apologizing for it at every party." "You may not be able to alter reality, but you can alter your attitude towards it, and this, paradoxically, alters reality. Try it and see." "Before you go out and press that fast forward button, I’m hoping, I’m praying, that you’ll have the courage to first press the pause button." "This is your time and it feels normal to you but really there is no normal. There’s only change, and resistance to it and then more change." "The work itself is the reward, and if I choose challenging work, it’ll pay me back with interest. At least I’ll be interested, even if nobody else is." "I was a Democrat before I was a Republican before I became an independent and I never changed my principles." "At a time when many workplaces were filled with not just glass ceilings but brick walls, this school was urging black women to become doctors and lawyers, engineers and ambassadors." "When you work for other people you’ll find … that they do know what’s best for them, and for the company. And you should listen to them and be respectful, but they don’t know what’s best for you." "Love the poor. Do you know the poor of your place, of your city? Find them. Maybe they are right in your own family." "I don’t want to die … I don’t want to die poor. Two great motivators in the history of human cultures." "Your education is a dress rehearsal for a life that is yours to lead." "Your calling isn’t something that somebody can tell you about….You know it inside yourself." "I waited a long time out in the world before I gave myself permission to fail. Please don’t even bother asking. Don’t bother telling the world you are ready. Show it. Do it." "Do stuff you will enjoy thinking about and telling stories about for many years to come. Do stuff you will want to brag about." "There are many well-meaning people today who work at placing an economic floor beneath all of us so that no one shall exist below a certain level or standard of living." "My favorite animal is the turtle. The reason is that in order for the turtle to move, it has to stick its neck out." "Whoever invented spray cheese had to have been a Harvard guy." "Don’t let your fears overwhelm your desire. Let the barriers you face—and there will be barriers—be external, not internal." "People will say you can’t do good and do well. They’re wrong, that’s idiotic advice." "Life is an improvisation. You have no idea what’s going to happen next and you are mostly just making things up as you go along." "What will you do? Well, I’ll tell you one thing you’re not going to do, and that’s take it with you." "Remembering that you are going to die is the best way I know to avoid the trap of thinking you have something to lose." "It’s hard not to be afraid. Be less afraid." "It is your grandparents and your parents … who brought you into this world with a chance to live the American dream. Will your generation do as much for your children?" "There is no delete button for bigotry." "Your rising from bed every morning will give fear its chance to grow stronger just as it will afford faith its chance to blossom." "You all have a lot of things you want to do and you’ll get some of them done." "As you set off into the world, don’t be afraid to question your leaders. But don’t ask too many questions at one time or that are too hard because your leaders get tired and/or cranky." Thanks for reading this list of the greatest graduation quotes of all time. We hope you enjoyed them! 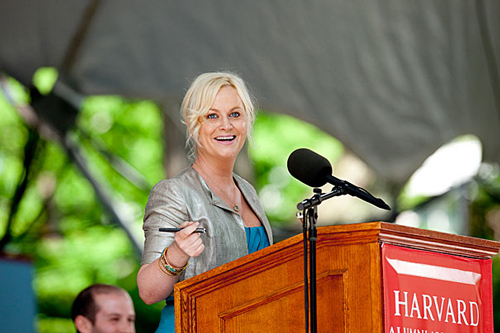 [caption id="attachment_2466" align="aligncenter" width="500"] Amy Poehler delivering one of her funny graduation quotes at Harvard. [/caption] Here are 107 of the best celebrity graduation quotes of all time for commencement speech season. Everyone from Will Ferrell to Bill Cosby to Whoopi Goldberg and everyone in between have given graduation speeches at universities for years. So here are some of the best celebrity graduation quotes that range from the funny to the inspirational to the flat out great advice. "The biggest uncontrolled gusher of pollution, by far, is the global warming pollution we’re putting up at the rate of 90 million tons per day." - Al Gore, University of Tennessee, 2010 You're currently reading the greatest graduation quotes. Keep reading for more! "I too turned to Webster’s Dictionary and it defined Harvard University as a season for gathering crops." - Andy Samberg, Harvard University, 2012 You're currently reading the greatest graduation quotes. Keep reading for more! "When I was here there was still a requirement that students had to swim 50 yards to graduate…because Harry Elkins Widener had drowned with the sinking of the Titanic. And it made me very grateful at the time that he had not gone down in a plane crash." - Barney Frank, Harvard University, 2012 You're currently reading the greatest graduation quotes. Keep reading for more! "Get outside of the box. Make things happen, be your own person." - Bo Jackson, Auburn University, 2009 You're currently reading the greatest graduation quotes. Keep reading for more! "Work hard, be kind, and amazing things will happen." - Conan O'Brien, Dartmouth College, 2011 You're currently reading the greatest graduation quotes. Keep reading for more! "It’s not a matter of if you will face adversity in your life but when. So when adversity knocks on your door, see it as an opportunity." - Drew Brees, Loyola University, 2010 You're currently reading the greatest graduation quotes. Keep reading for more! "Yesterday is gone, tomorrow may never come, but as long as we have today, we can change the world." - Glenn Beck, Liberty University, 2010 You're currently reading the greatest graduation quotes. Keep reading for more! "It is impossible to live without failing at something, unless you live so cautiously that you might as well not have lived at all—in which case, you fail by default." - J.K. Rowling, Harvard University, 2008 You're currently reading the greatest graduation quotes. Keep reading for more! "When [you’re scared] … go back to the days of your childhood, go in the 100 Acre Wood, take a deep breath and just say, “I’m stronger than I seem, I’m braver than I believe, and I’m smarter than I think.”" - James Carville, Hobart and William Smith Colleges, 2013 You're currently reading the greatest graduation quotes. Keep reading for more! "Where a child is born, what color that child is or how much money that child’s parents make often determines the quality of his or her education." - John Legend, Kean University, 2011 You're currently reading the greatest graduation quotes. Keep reading for more! "So how do you know what is the right path to choose to get the result that you desire? And the honest answer is this. You won’t." - Jon Stewart, College of William and Mary, 2004 You're currently reading the greatest graduation quotes. Keep reading for more! "You may not be able to alter reality, but you can alter your attitude towards it, and this, paradoxically, alters reality. Try it and see." - Margaret Atwood, University of Toronto, 1983 You're currently reading the greatest graduation quotes. Keep reading for more! "The work itself is the reward, and if I choose challenging work, it’ll pay me back with interest. At least I’ll be interested, even if nobody else is." - Meryl Streep, Vassar College, 1983 You're currently reading the greatest graduation quotes. Keep reading for more! "Love the poor. Do you know the poor of your place, of your city? Find them. Maybe they are right in your own family." - Mother Teresa, Niagara University, 1982 You're currently reading the greatest graduation quotes. Keep reading for more! "I waited a long time out in the world before I gave myself permission to fail. Please don’t even bother asking. Don’t bother telling the world you are ready. Show it. Do it." - Peter Dinklage, Bennington College, 2012 You're currently reading the greatest graduation quotes. Keep reading for more! "People will say you can’t do good and do well. They’re wrong, that’s idiotic advice." - Soledad O'Brien, University of Delaware, 2012 You're currently reading the greatest graduation quotes. Keep reading for more! "It’s hard not to be afraid. Be less afraid." - Susan Sontag, Vassar College, 2003 You're currently reading the greatest graduation quotes. Keep reading for more! "Art is love." - Yoko Ono, Maine College of Art, 2003 Thanks for reading this list of the greatest graduation quotes of all time. We hope you enjoyed them!